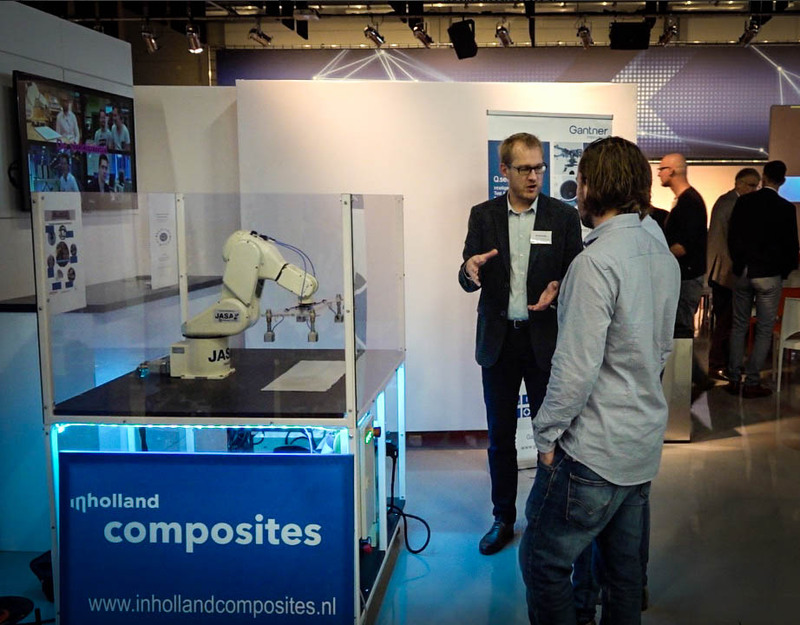 On October 18, 2017 Inholland Composites participated in an event organised by CompositesNL, the Dutch Composites Association. 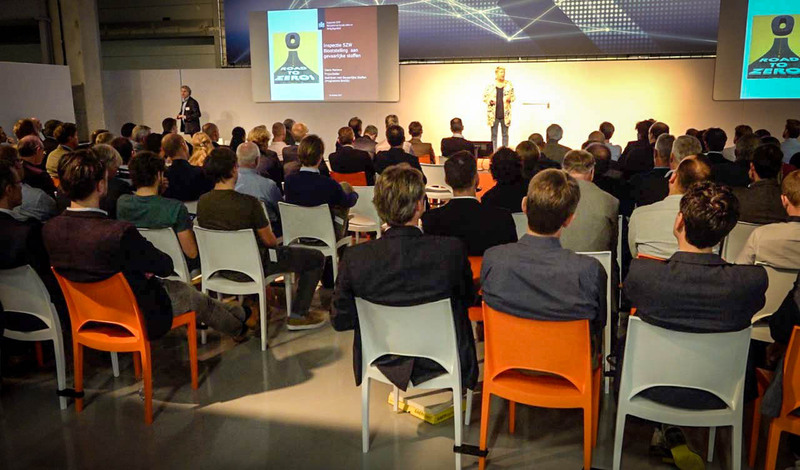 The members of CompositesNL have set themselves the goal of developing the social benefits of and new preconditions for the application of composites, and introducing them to the market and society as a whole. During the October 18 event, the association took the opportunity to present its new format of the periodic general meeting (ALV). 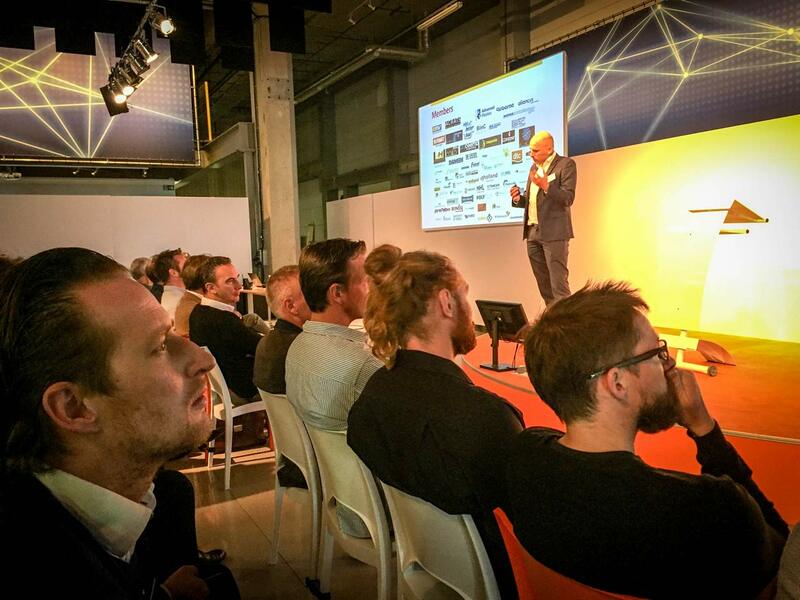 This time the CompositesNL-event was held in the Digital Factory for Composites fieldlab in Ypenburg-Den Haag. CompositesNL chairman Marcus Kremers (recently appointed board member and Airborne CTO) opened the event. 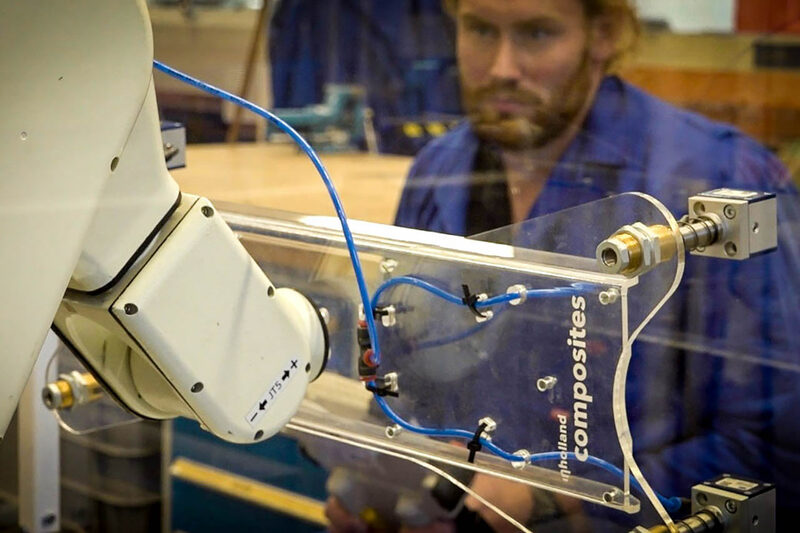 Inholland Composites premiered its new mobile robot-arm demonstrator. This setup had been used during the Raak MKB project Robocompo to perform research in automation of the vacuum infusion process. After the completion of this project in 2016, the robot setup was further developed thanks to the SiA Top-up subsidised program. One of the deliveries included a mobile demonstrator which was recently finished at the Inholland Composites location in Alkmaar. Approximately 160 people had the opportunity to receive a demonstration from Mark Wokke, Rogier Nijssen and Arnold Koetje. Mark Wokke, project engineer Inholland Composites: “I am really excited about our new demonstrator. It is now equipped to support pick-and-placement operation using needle grippers and we are planning to add some other features which obviously can be expected in the integrated approach for automation of composites production”. During the member assembly, Rogier Nijssen, professor in composites at Inholland University of Applied Sciences, and moderator of the association’s educational working group (http://compositesnl.nl/en/education), presented a brief update on the working group activities. In the spring of 2018, an event will be planned where speakers from various levels and types of education will share their views on composites education.